Raid Tan Hill 2018, Sunday 7th January. 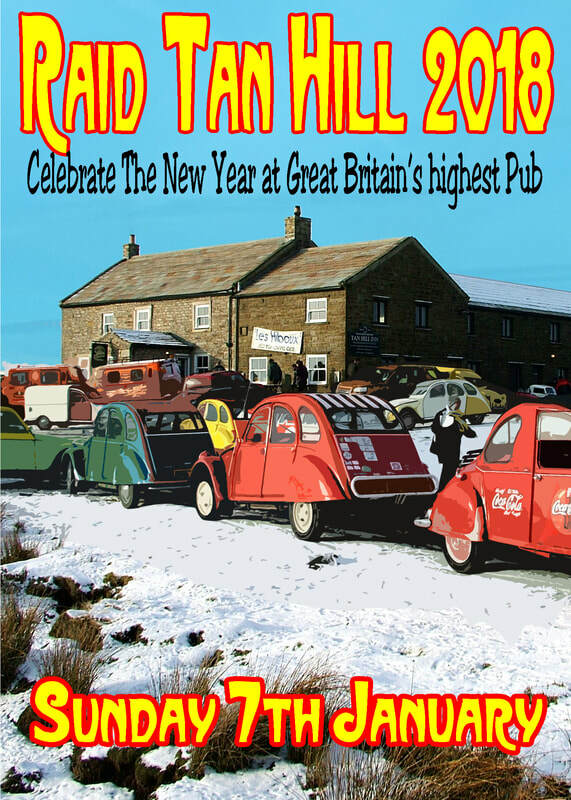 New Year at Great Britain’s highest inn! The event started early on Sunday morning at the Lawnswood Arms on the A660 Leeds - Otley Road. The pub doors opened at 8.30 a.m. to provide tea, coffee and bacon/sausage butties. Having taken on sustenance for the task ahead we left the pub at 10 a.m. and set off in convoy on a 60 mile spectacular route through the Yorkshire Dales National Park. Along the Wharfedale Valley, then Upper Wharfedale, through Langstrothdale, over Fleet Moss, at 1932 ft above sea level Yorkshire's highest road, down to Hawes, onwards over the Buttertubs Pass, through Thwaite and Keld, climb the exciting Keld Bank and finally over the vast expanse of Stonesdale Moor to Tan Hill. En route we stop in the beautiful Langstrothdale for a photo call and Hawes for a glass of hot mulled wine. Arriving at Tan Hill at approx. 1.30 pm we had exclusive use of the pub’s heated barn, lunch was available from a special Raid Tan Hill menu, there were 2CV videos on the large screen, and we finished at about 3.00 pm with our famous free raffle and the handing out of certificates and stickers. Every driver completing the route from the Lawnswood Arms to the Tan Hill Inn received a certificate and car sticker, with special ones for the oldest car and the furthest travelled. A midwinter trip to Tan Hill is always a challenge, whether it is on foot along the Pennine Way, which passes the door, or in the relative comfort of a small, air-cooled, two cylinder, French motorcar. With its 1 in 4 ascents, steep descents, narrow roads and the possibility of snow it is not for the faint hearted.